Try your Luck at the Pot with £350 Deposit Bonus + 175 Spins on Starburst! BetAndSkill is proud to introduce Pots Of Luck Casino, a newly developed online casino games site that’s lively and very easy to enjoy. Join via BetAndSkill and claim an exclusive £350 welcome bonus + 175 free spins on Starburst on the first three deposits! Enjoy one of the best newcomer in the casino industry this year! 1. Open a new account with Pots Of Luck Casino via this special link! 2. Start playing in less than 30 seconds and claim a HUGE bonus on your first three deposits! 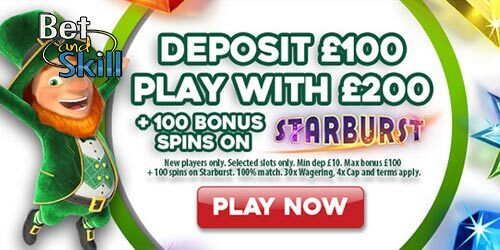 1st deposit - 100% deposit match up to £100 in bonus and 100 spins on Starburst. In total, you can grab £375 bonus + 175 bonus spins! 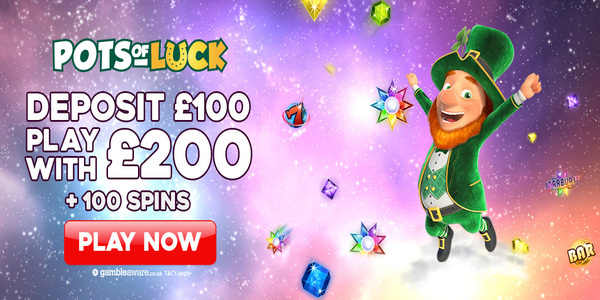 Pots of Luck is the new Irish-themed casino with the very best online casino games and slots like Rainbow Riches!! With over 1200 games available on mobile, you can play anywhere, anytime via your tablet or smartphone (iOs, Android, etc..). Just launched, it looks modern and fresh, features a healthy welcome bonus package. Pots Of Luck Casino is completely licensed and regulated by the UK Gambling Commission. To be eligible to claim each stage of the Welcome bonus, players must deposit a minimum of £10 for each of the three deposit matches. Bonus funds carry a wagering requirement of 30x the sum of your deposit and bonus amount (e.g. £10 deposit + £10 bonus x30 = £600), which must be met before the bonus and any winnings are converted to capped cash, and this and any further winnings become withdrawable. The maximum conversion amount from bonus funds, including free spin bonus funds, will be capped at 4x the initial bonus amount awarded. Bonus funds convert automatically once wagering is complete. Once credited your match bonus remains valid for 28 days. Should you not complete the wagering requirements in this period, remaining bonus funds will be removed from your account. Spins will be activated when you launch Starburst, and are valid for 7 days. These Spins will be worth 10p and are valid on Starburst only. All winnings earned from the spins will be rewarded in bonus funds and carry a wagering requirement of 30x the total bonus amount earned. For example, free spin winnings of £10 would have a wagering requirement of £300 before converting into cash, up to a maximum of 4x the bonus amount awarded. Only bets placed using bonus funds count towards the wagering requirements of the bonus. Cash funds are always wagered with before bonus funds. Only one bonus can be active at a time. Please go to "my profile" section to view your entire bonus queue. Where any term of the offer or promotion is breached or there is any evidence of a series of bets placed by a customer or group of customers, which due to a deposit bonus, enhanced payments, free bets or any other promotional offer results in guaranteed customer profits irrespective of the outcome, whether individually or as part of a group management reserves the right to reclaim the bonus element of such bets. We further reserve the right to ask any customer to provide sufficient documentation for us to be satisfied in our absolute discretion as to the customer's identity prior to us crediting any bonus, free bet or offer to their account. Gamble responsibly. For more info visit www.begambleaware.org or telephone Freephone Helpline: 0808 8020 133. "Try your Luck at the Pot with £350 Deposit Bonus + 175 Spins on Starburst!"